Can you imagine packing up your family and moving abroad? The thought may very well give you a slight panic attack or it may induce a little spark of curiosity. Either way, Families Around the World will give you a sneak-peek at American families who are living abroad — from far off exotic places such as Abu Dhabi in the Middle East to the bustling metropolis of Rome and everywhere in between. Stay tuned for a look at what life is like raising a family away from home. Laura Goertzel and her husband Bruce are no strangers to living abroad. 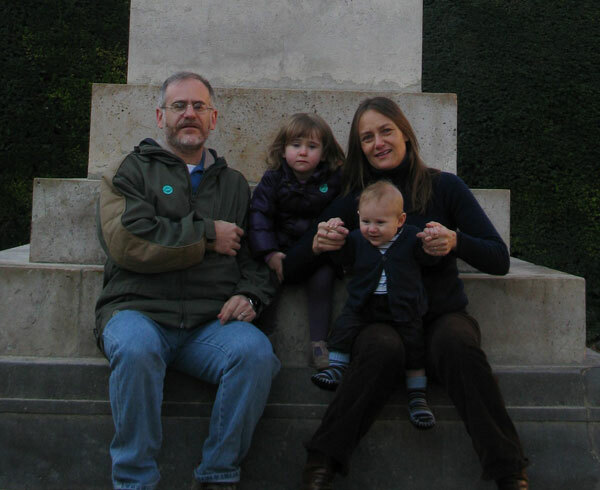 Before settling in Paris over two years ago, they lived in Beijing, China. On top of that, their two children, Lily and Leo, were both born outside of the United States — Lily (3) in Beijing and Leo (9 months) in Paris. Laura is currently a stay-at-home mom. She worked previously as Senior Website Editor and Radio Producer for KOL, the children’s division of AOL and more recently in Paris working at the American Embassy. Bruce is a foreign services officer for the State Department, which is the job that brought them to Paris. And, from what Laura tells us about daily life in Paris, we don’t blame her for pinching herself. Every morning, they walk Lily to her French public school, which is called maternelle. Lily is fully-immersed in French while at school — she is the only child who speaks English as her first language (which it is, despite learning to speak while in France! 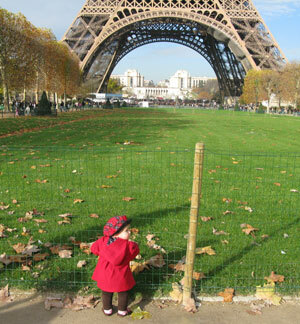 ), but Laura notes that she has no problem keeping up with her Parisian peers. Even at just 3-years-old, Lily attends school from 8:30 a.m. – 4:30 p.m. during the week, which is typical for French children. When Laura was working, Leo had a nounou caring for him, otherwise known as a nanny. They have used a French nanny and a Kenyan nanny for Leo. After dropping Lily off at school — past the Eiffel Tower, naturally — Leo and Laura hit up the outdoor market for fresh bread, vegetables and other ingredients to make dinner. Then they spend the afternoon at the park or visiting with friends, just as they’d do in America. Leo was coming and he was coming quick. Laura, who confesses that she was down on all fours, seemingly auditioning for the starring roll in a Lamaze video, waited anxiously at home for Bruce to arrive and take her to the hospital. One he arrived, Bruce took the stairs down from their apartment building, while Laura and the nanny took the phone booth-sized elevator to meet him in the lobby. Frantic phone calls to the guardinne (think NYC building super), the elevator company and the pompier crew (firefighters) were made, with the pompiers arriving first, using a special key to unlock the elevator doors. Little Leo was born safe and sound at the American Hospital Paris, just a few hours later. Being a vegetarian in Paris is challenging for Laura — dining out in a city that is known for its meat-focused menus can be tricky. On the weekends, the Goertzel Family loves to get in the car and do some exploring in the forests and little villages that surround Paris. By law, stores are required to have two, and only two, huge discounted sales on their items a year. One is just after the New Year and one is during the summer. There can be other markdowns on products in between those times, but not on the same level.